Kill ants, roaches, aphids, and many more! 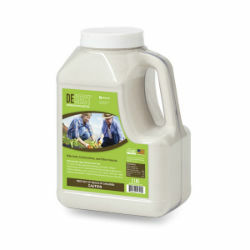 Specially blended diatomaceous earth (DE) for effective insect control. DEsect™ HG physically abrades and absorbs the exterior protective waxy cuticle layer of the insect, resulting in rapid death by dehydration. Kills insects dead on contact. Insects cannot become immune. Easy and ready to use, with shaker style lid for easy application. Kills Roaches, Slugs, Ants, Earwigs, Grasshoppers, Crickets, Silverfish, Millipedes, Centipedes, Sow bugs, Pill Bugs, Lice, Box Elder Bugs, and Carpet Beetles. DEsect HG™ is also effective against Aphids, Snails, and Japanese Beetles. Registered Organic with OMRI (Organic Materials Review Institute) and the EPA. Garden & Plants: Apply dust or solution to entire plant and around the base of plants. Fruit Trees: Apply dust or solution to leaves and put a perimeter of dust around the trees.